THE SCHOOL OF LIFE IS DEDICATED TO EXPLORING LIFE'S BIG QUESTIONS IN HIGHLY-PORTABLE PAPERBACKS, FEATURING FRENCH FLAPS AND DECKLE EDGES, THAT THE NEW YORK TIMES CALLS 'DAMNABLY CUTE.' WE DON'T HAVE ALL THE ANSWERS, BUT WE WILL DIRECT YOU TOWARDS A VARIETY OF USEFUL IDEAS THAT ARE GUARANTEED TO STIMULATE, PROVOKE, AND CONSOLE. Everyone accepts the importance of physical health; isn't it just as important to aim for the mental equivalent? 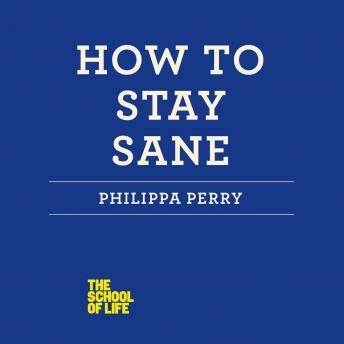 Philippa Perry has come to the rescue with How to Stay Sane -- a maintenance manual for the mind. Years of working as a psychotherapist showed Philippa Perry what approaches produced positive change in her clients and how best to maintain good mental health. In How to Stay Sane, she has taken these principles and applied them to self-help. Using ideas from neuroscience and sound psychological theory, she shows us how to better understand ourselves. Her idea is that if we know how our minds form and develop, we are less at the mercy of unknown unconscious processes. In this way, we can learn to be the master of our feelings and not their slave. This is a smart, pithy, readable book that everyone with even a passing interest in their psychological health will find useful.